Pictured below is a highly specialized under-slung carriage, supported by a double girder trolley. The geared “turn-table bearing” permits a 360 degree rotation of the carriage. In its final configuration, it will support four 10-ton monorail hoists, for a total capacity of 40 tons. 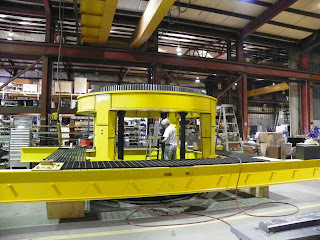 Just one more example of American Crane’s specialized capabilities in Custom Design and Manufacture. For more information about our Custom Engineered Equipment click here. Visit our homepage to see all our Industrial Solutions, Products and Services, call us at 1-877-877-6778 or email at sales@americancrane.com.